Mobile Entry is the easiest and safest way to access tickets to your events. When your event is Mobile only, or you selected Mobile Entry at checkout - your mobile phone is your ticket. Your tickets will not be available for print or emailed to you. Upon arrival to your event, locate your tickets in your Ticketmaster app or the mobile website. You'll show your ticket to the ticket scanner, your barcode is scanned - and you're in! 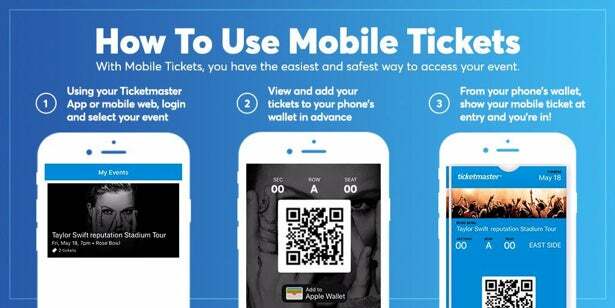 Open your Ticketmaster App or visit Ticketmaster using your mobile internet. Login to your Ticketmaster account and locate the order with your ticket(s). Please note: Mobile Entry is not available for all events. Please refer to your ticket order in your account. Download our app to manage your tickets - all in one place! Available in the US and Canada only. We recommend viewing your Mobile Entry tickets prior to arriving to your event. 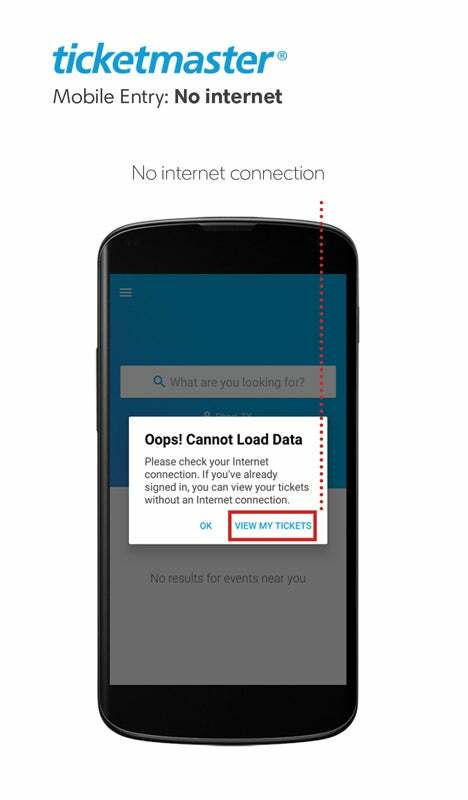 Our app will save your tickets and will allow you to view them in the event, even if you lose internet access. See Example Here. If you're using our mobile site instead of the app, you will also be given the option to save your tickets if viewed prior to losing internet connection. If you're unable to access our app, you can still use the browser on your mobile device to view your Mobile Entry tickets. If the ticket transfer feature is available on your order, you may "Transfer" the tickets purchased to your recipient. Once they accept their tickets, the tickets will be in their account. Please ensure the email address used is the same email address they use to login to their Ticketmaster account. Please note: not all orders/events are eligible for Ticket Transfer. If the "Transfer" button on your order is missing or not available to click, Ticket Transfer is not available for this over/event.